Shadow of the Colossus first came out in 2005. Since then, millions of people have played the beloved PS2 game, driven by its lonesome charm, moved by its mysterious ending. But one man never stopped playing, as a result, he's found stuff that the game's creators never intended anyone to see. The player in question is Michael Lambert, and he's been excavating Shadow of the Colossus for the last four years on his Nomad Colossus YouTube channel. He's used glitches, external software exploits, and excursions into the bowels of SOTC's game code to extensively map the hidden places, unused ideas and unheard music tucked away in the game's hidden corners. With the hours he's spent inside the game, it's entirely possible that Lambert—along with the secret hunters Dark0ssX, Pikol, WWWArea who mentored him—might know Shadow of the Colossus better than lead creator Fumito Ueda and the other men and women who created it. After Lambert uploaded a video of unseen beta levels from SOTC predecessor Ico, I reached out to ask him why he's still trying to dissect a game that most of the world has moved on from. Here's what he has to say. Kotaku: In your very first blog post, you mention that your introduction to Shadow of the Colossus was when your brother couldn't get past the first Colossus. Did he ever finish the game? Does he know that you're still playing and unlocking new secrets? Lambert: No, he never finished the game, he wasn't that interested as it's not his type of game. But he's aware of my interest in it although it's not something we talk about or anything like that. I don't really bring it up as it's not a topic he would really care about. Even with my close friends and work mates, I don't talk about it. [Without] delving as deep into the game as I have, [I think] they wouldn't understand my interest. To them it's just another video game. Kotaku: Is there anything that you're still looking for? Development areas that you've heard about but not seen with your own eyes? Lambert: Yes, in fact. Just recently another fan and I have been discussing where the 8 discarded colossi may have existed on the game map. I had made videos about my speculations on this in the past, but together we have found more evidence and have pinned down almost all of the eight discarded colossi, although a couple are still speculative. I have seen everything there is to see now (sadly) and I have no illusions that I will ever see anything else released by Sony (i.e. extra images of the discarded colossi or videos, earlier builds of the game etc.) I have searched for any other (older) versions of the game but so far only have the 'official' publicly released demos and retail releases of the game. However, we did score an earlier (pre-release) version of the full game. Fans call it the 'preview version,' but all my attempts to contact the buyer have gone unanswered. I would love to know where he acquired this version. I also know of another demo that was sent to game magazines early on but wasn't released to the public, so to get my hands on this would be great. Can't see it happening though. In the three demos we know of —OPM, PSU and PAL—you can only fight the first colossus, but in this rare version you got to fight the first three. I have some video footage of it but that's the only evidence of its existence. If only we could get some information from Team Ico about this, but it's equivalent to getting blood from a stone, all my attempts at contact have fallen on deaf ears and I believe they have strict instructions not to discuss their work with outsiders like me. I was briefly in contact with Keiichi Kitahara (the sound engineer) but as soon as I mentioned the discarded colossi all contact was ended. Kotaku: Can you get a sense of how SOTC's game design might have been different if Team Ico had more time? 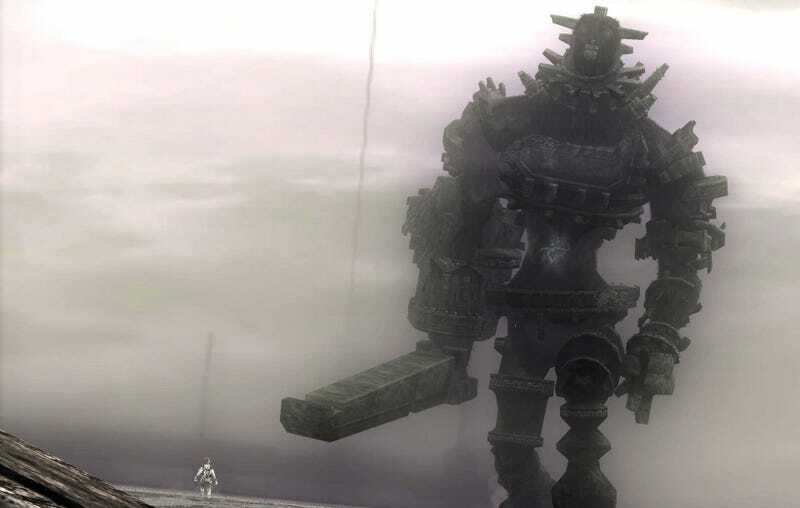 Lambert: Ueda has stated that they were about half way through development when they decided to reduce the field of play and remove some of the colossi, knocking the final number down to 16, so I'm not sure they would have had enough time to get the extra ones working properly. From what we know they removed the colossi they were having problems with i.e. the battle being too difficult or tedious, collision detection issues etc. Instead they concentrated on making the 16 final colossi as good as they could in the time allowed. But fans have always wished for an add-on pack or some downloadable content that would restore the original 'larger map' version of the game, although how this would work is problematic as the story ends when Wander defeats the final (#16th colossus). Kotaku: Does the game still hold any mystery for you now that you've pulled it apart so thoroughly with glitches and hacking? When will you be done with SOTC? Lambert: Yes, it does although I know there is nothing more to find that I haven't seen already. It's a finite game after all and eventually I came to a point where there was nothing left. But that still doesn't mean it's the end [of exploration] as the maps contain clues and remnants of earlier builds. So it's always exciting when a new find reveals something, however trivial. I still update my blog with any new information I find and still have a lot more content to add, but eventually even this will end. Kotaku: As someone who's a fan of Team Ico and Ueda, how do you feel about the long wait for The Last Guardian? Are you able to control your expectations at all? Lambert: It's disappointing to say the least, and I'm not the only one who feels ripped off for having to wait so long... we were all excited about it in 2009 when they announced it. We were shown an amazing trailer and images from the game, then abruptly it all stopped. Six years later and we are still waiting, ten years since Shadow of the Colossus was released, and even today all we have are rumours and conjecture: -the game was being cancelled, then it wasn't, Ueda has left Sony but is still under contract to finish the game, it's being released for the PS3, now it seems it will be a PS4 release and so forth. I still hold out hope that it will be released one day, every year I think 'maybe this year' then it passes without a word. Until then I'll keep working on their other two games and continue to show fans what I find.